NORTH AUGUSTA, SC: The Augusta GreenJackets, South Atlantic League affiliate of San Francisco Giants, with partnership with EDTS Cyber are excited to announce that on Friday, June 14th, the GreenJackets will be the first professional baseball team to put on a Drone Light Show following the game against the Rome Braves. "EDTS Cyber are excited to be collaborating with the Augusta GreenJackets to bring an innovative alternative to fireworks to the CSRA this baseball season," says Charles Johnson, Founder and CEO of EDTS Cyber. "We are looking forward to seeing the excitement and joy this light show will bring to the faces of baseball fans this year." 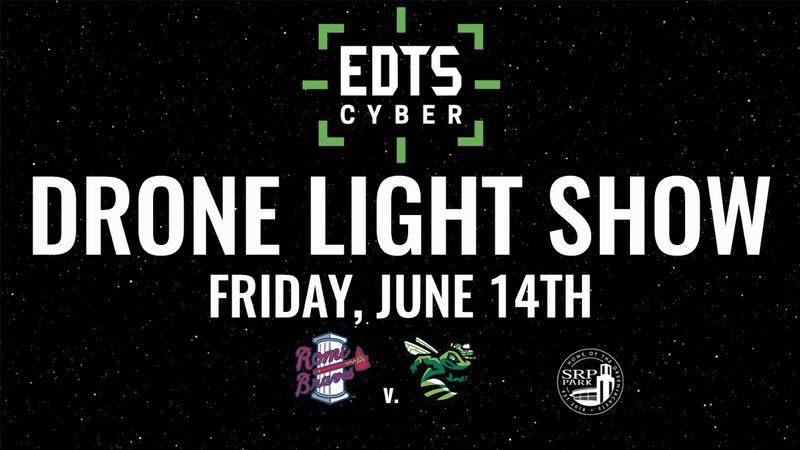 The GreenJackets will have a fully customized 25 drones light show to wow the CSRA with after the game on Friday, June 14th. With the partnership of EDTS Cyber and The Great Lakes Drone Company, the sky will light up with the brightest lights on the drone show market at 7000 lumen. This is not only the first time for a professional baseball team to host a Drone Light Show but also the first one to be held in the CSRA. "I became familiar with these types of shows about two years ago and have been waiting for the opportunity to do something this unique since then. This is going to be a very cool experience and not one to be missed." - Jeff Eiseman, President, Augusta GreenJackets. Ticket prices for the Drone Light Show presented by: EDTS Cyber will start at $9. Single Game tickets for the 2019 season will go on sale at a later date. If you are interested in bringing a group out for the Drone Light Show (20+) please call the GreenJackets at (803) 349-WINS (9467). For more information visit GreenJacketsbaseball.com or call (803) 349-WINS (9467). The GreenJackets have rolled out for the 2019 season the all new Membership Program. Members will be able to enjoy the 2019 season with exclusive perks, parties, giveaways, savings and much more. If you're looking for flexibility, savings, or the perfect number of games to match your life, then the GreenJackets Membership Program is for you. To learn more about the Membership Program, visit www.gjmembers.com or call (803) 349-WINS (9467). EDTS Cyber helps organizations protect their data, secure their systems and respond to cyber incidents. Employing top talent, utilizing innovative technology, and following industry best practices. Protecting clients from its 24x7 Security Operations Center (SOC) located in Augusta GA, EDTS Cyber offers companies the full-lifecycle of IT security -auditing for current security gaps, remediation of those issues, real-time security monitoring, incident response and forensics, along with consistent user security awareness training and testing. Learn more by visiting us online at EDTSCyber.com. Great Lakes Drone Company is located in beautiful Southwest Michigan. We are an aerial video, photography and survey firm dedicated to recognizing our clients visual concepts and needs to produce the high quality imagining they need for their advertising, film and inspection needs. We utilize state-of-the-art equipment to produce high quality photos, promo videos, commercials, and movies at affordable prices not previously seen in aerial photography and video. Our Unmanned Aerial Vehicles (UAV's) are equipped with the latest electronics, including HD video cameras, gyro-stabilized gimbal camera mounting systems, and progressive software applications to get the shots and footage that were previously only available from full size aircraft.